Gracious service and exclusive treatments utilizing produce harvested on-site are the cornerstones of the Spa at Farmhouse by Francis & Alexander. Conceived as a natural extension to Sonoma farm-inspired experience, our farm-to-table spa menu sparkles with Spring Forest Honey and heirloom cider apples from our own home ranch, along with herbs grown in the Farmhouse Inn kitchen garden. A true partnership between the inn and Francis & Alexander, the Spa at Farmhouse is a labor of love for Peggy Francis and Loma Alexander, who have consulted, operated, and helped design some of the world's most prestigious spas, including The Spa at Auberge du Soleil, Solage in Calistoga, and The Spa at Palmetto Bluff. Here, their passion is evident in details large and small. Please call 707-887-3300 Ext. 222 to schedule your bliss. At last, it’s time to shed the winter layers and step into the sweetly scented splendor of springtime. 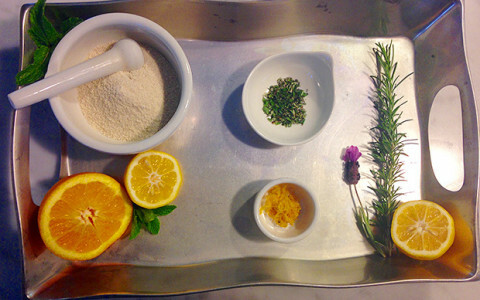 You’ll find our seasonal Citrus & Herbs Scrub, Rub and Shrub the perfect antidote for winter-weathered skin. Designed to soothe dry, itchy areas and reveal healthy, hydrated skin, our three-step treatment begins with an Orange Rosemary elixir and includes a full-body exfoliation to boost circulation, an invigorating outdoor shower, and a full-body essential oil massage infused with orange, basil, and cedar. This signature spa experience begins with an interactive spa consultation using a state-of-the-art app to create the customized spa treatment of your dreams. Together you are intuitively guided in making a unique blend of therapeutic oils specifically for you, which is used throughout your Personal Apothecary service. *Personalized blends for home care or gifts are available at the Spa Boutique. This Farmhouse Inn favorite allows you to choose the type of massage you need, from slow and soothing to firm and deep. A selection of skin nourishing potions and balms are available to customize your service. Appropriate for all stages of pregnancy. We give the utmost care to your comfort level by using professional body-support cushions and pillows. A soothing blend of oils replenishes your skin and soothes your soul as your therapist targets the areas of tension that are most common during pregnancy. Your head, neck, shoulders, hands and feet are soothed and cared for, while you rest soundly and comfortably on the table. CBD is known for its superior anti-inflammatory qualities and is beneficial for body and mind. Our CBD contains skin nourishing oils of lavender, avocado and grape seed. Ask about our CBD bath bomb to take back to your bath to continue your spa experience. The best of all possible massage worlds! A masterful blend of healing hands, warm gliding stones and aromatic hot herbal towel infusion makes this medley the ultimate path to bliss. Relax as the healing properties of ginger and honey seduce the senses, revitalize your skin and enhance your immune system. A complexion-brightening bee propolis back mask and a honey and glycerin mini-facial are both included within the 90 minute session. Large steamy compresses are filled with a special blend of herbs and rolled on the body to soothe the nervous system and help calm inflammation in muscles and joints. The therapists combine stretches, massage and these warm compresses to take you beyond a blissful state of mind. This head-to-toe experience is a favorite at some of the most prestigious spas in the world and one of our owner's favorites. A lavender-orange hair and scalp treatment invigorates the scalp and moisturizes the hair. A lavender tangerine body butter massage and lemon verbena foot scrub treatment are masterfully woven together to create a flowing experience, leaving you happy head to toe. In days past, farmers used alfalfa hay to help extract lactic acid from sore muscles. Today at Farmhouse Spa, you are nestled into a large warmed moist body pillow filled with muscle healing herbs of alfalfa, lavender and chamomile. The herbs assist in detoxifying the body, calming the mind and relaxing the muscles while transporting you into a deep rest. A full body massage using our handcrafted herbal “Muscle Melt Balm” completes the service. Seasonally, our spa apothecarist Tamara and our estate chef Neil team up to create a synergistic seasonal body scrub and healthful shrub to drink, from the Farmhouse kitchen garden and local purveyors. You may blend your seasonal scrub ingredients by hand or watch as your therapist crafts it for you. Enjoy a full body exfoliation and massage as you toast to your health with a refreshing shrub.Ask our Spa Concierge about our current seasonal offering! A no nonsense massage isfollowed by an organic mini-facial with bio-nutrient products made 4 men by men with age defying and environmental defense benefits including red wine polyphenols. This facial begins with a botanical re-surfacer that prepares the skin to receive hydrating serums rich in nutrients, peptides and stem cells. The latest in micro-current technology is then used to lift and tone your skin. This facial is determined after a short consultation and determination of what is best for your needs at this time. Powerful peptides, Vitamin C infusions, plant-derived stem cells, and enzymatic botanicals are selections made by you and your esthetician. Leave with luminous skin that is refreshed and rejuvenated. This facial is excellent for any skin type from acne prone to aging skin. Gentle yet highly effective this facial helps to reduce redness and inflammation, leaving the skin hydrated, smooth and soft. Aloe and jojoba beads are used to exfoliate the skin without compromising the barrier. Serums and a hydrating mask leave the skin ready to receive a stem cell rebuilding complex and finishing moisturizer. Erase fatigue with a Farmhouse Inn Spa antidote to the stress of travel. A mini (but mighty) facial offers exfoliation and a hydrating gel mask for face and feet. Feet are cocooned in warm booties after a hydrating mask is applied. A micro-current eye lift and Biotic Nap, which simulates 4 hours of sleep in 30 minutes, leave you refreshed and ready for Wine Country. We proudly present the award winning OM4MEN organic bio-nutrient products for the special needs of male skin. Tips for shaving concerns that impact the skin are available during this facial, if desired. Shave the night before, if possible. Playtime begins with exfoliating each other with a special scrub in your own private steam room. Following the steamy session, you will head to the spa to receive a side-by-side lover's massage. Once back in your private room, luxuriate together in a sensually-scented, skin softening bubble bath. Complete the evening with a game designed to inflame your passion for one another. The fun begins on the private couple’s room patio. Start with exfoliating each other in the outdoor shower with our Apothecarist edible scrub before jumping into the tub to enjoy a special handcrafted bath bomb as it fizzes and foams releasing an intoxicating blend of sandalwood, orange and with a sweet kiss of cinnamon. Continue the romance with side-by-side massage using a sensual blend of vanilla and blood orange oil. Ask about a winter alternative for this treatment. Begin by soaking in the private outside tub with a CBD bath bomb to prepare the body to receive a CBD oil massage side by side. Begin with a couple’s spicy mocha scrub to smooth the skin and wake up the senses. After an outdoor rinse, cozy up next to each other on a heated, private back porch lounge and nestle into a wrap under a warm body pillow filled with aromatic herbs and sweet alfalfa. A side of seasonal treats from our estate kitchen and wine is yours to share with one another as you rest cozy and content. Once your bodies have melted, sip on aphrodisiac elixirs and enjoy side-by-side massages with our sensual blend of oils. (Alternative beverage selections are available if wine is not preferred. )We recommend the Body Melt when our Roll in the Hay is unavailable due to weather. Enjoy side-by-side massages of your choice in our spacious couple’s room. After a house-made farm-to-body scrub and outdoor shower, your skin will soak in our nutrient rich Seasonal Body Balm during a full body massage and wrap. While cocooned in the balms, receive a lavender and tangerine scalp treatment complete with hair replenishment. A personalized facial for your skin type will leave you cleansed, hydrated and refreshed tip to toe. Our most popular combination for the perfect spa experience the Catherine’s Favorite (which includes massage, scalp and feet) followed by a facial of your choice. Top it all off with a Biotic Nap and hand reflexology. After a massage of your choice, enjoy a Smooth and Lift facial. A deeply relaxing Biotic nap, which simulates 4 hours of sleep in 30 minutes, and foot reflexology completes your renewal. Treatment hours are 8:00 am to 8:00 pm. Reservation hours are 8:00 am to 7:00 pm. Please specify your preference for male or female therapist if this is important to you. All of our therapists are highly trained professionals. If you have any medical needs or allergies, please notify us. to your level of comfort. We suggest you arrive in the robe and slippers provided in your room. Robe and slippers are available at the spa if you prefer. You will be properly draped for the entirety of your treatment. A 20% gratuity is added to all spa services. Gratuities are not prorated to reflect discounted pricing. You are welcome to adjust the gratuity by simply talking to the Spa Concierge. In consideration of the therapists and our other guests, we require a 24-hour notice for cancellations. For treatments that are 2 hours or more and for group bookings we have a 48 hour cancellation policy. Late cancellations will result in a full charge. 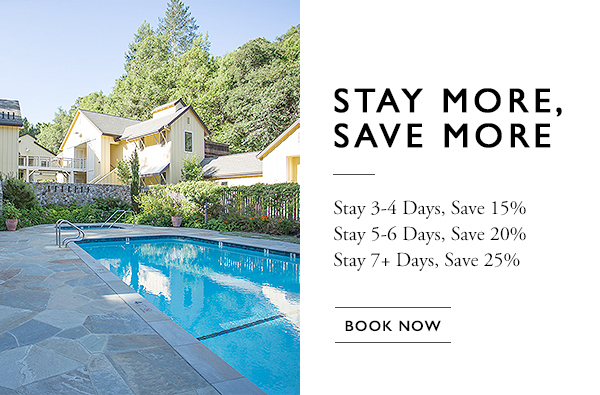 Rescheduling inside 24 hours will result in a $60.00 charge per service and guest. We use nut free massage oil and many botanicals in our products. If you have a known allergy, please inform the Spa Concierge when booking your service and we will accommodate you. We would like to acknowledge our spa apothecarist, Tamara Walker, for handcrafting products used in many of our body treatments and massages.